It's time for a new challenge here at Watercooler Challenges. With Christmas just over a month away, our challenge this week is to create something with a Christmas theme. I totally love the new Gentle Peace photopolymer stamp set from Stampin' Up!® This time I stamped the image onto Very Vanilla using Elegant Eggplant ink. 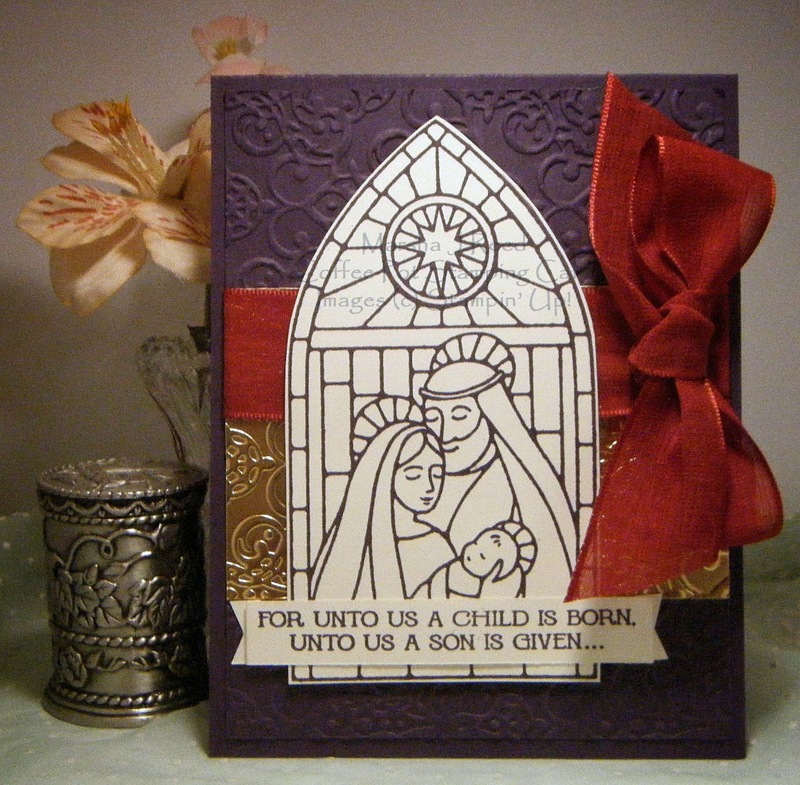 I love how it pops against the Elegant Eggplant card, the Gold Foil and the Cherry Cobbler Sheer Linen Ribbon. The design is a CASE (Case And Share Everything)from Monica Weaver. I don't use metal sheets but the Gold Foil sure makes for a pretty layer on the Elegant Eggplant. So, now it's your turn to show us what you are creating for Christmas. Just link up your project to the Watercooler Challenges blog HERE. Lovely card, Marsha. I like the non-traditional colors for a Christmas card. Thank you for being a part of the watercooler challenges !!! Looking forward to see what you do next. Thanks, Terri. Christmas is my favorite time of the year. What a beautiful card, Marsha. We're all into non-traditional colours this time around, I see. The ones you've chosen for this card are so elegant and really emphasize the simplicity (and beauty) of the centre image. Thanks so much for sharing. Thanks, Heidi. I've done a lot of non-traditional colors for my cards this year. So happy you used elegant eggplant here with the cherry cobbler ribbon. Wonderful. Thanks, Bev. I love how the Cherry Cobbler pops against the Elegant Eggplant. Thanks, Karen. I really appreciate your kind comments.